Image: Moni Soria/WIkimedia Commons, CC BY-SA 4.0. Santiago Maldonado disappeared during a raid by the Argentine Gendarmerie (the military border police) on August 1st, 2017. Maldonado is a tattoo artist who has travelled around the country, participating in diverse community projects and movements. On August 1st, he had been participating in a partial roadblock outside the Pu Lof en Resistencia Departamento Cushamen (the Lof Cushamen) in Chubut province, Argentina. That roadblock had been set up as part of the organising to free the Mapuche political prisoner Facundo Jones Huala, who in late June had been re-arrested and jailed on charges of a dubious nature. On August 1st, at the orders of federal judge Guido Otranto, the Gendarmerie launched yet another violent raid on the Lof, ostensibly to lift the roadblock. The Gendarmerie, however, moved well beyond the roadblock and into the community’s land. Witnesses stated that Maldonado did not manage to cross the river as he tried to escape the police who were firing both live ammunition and rubber bullets. They reported that he was caught by them, beaten and then forced into a military van. He has not been heard of since. The gendarmes, together with the provincial and federal governments, have consistently denied any knowledge of his whereabouts. They do so in the face of abundant evidence indicating that Maldonado remains, whether alive or not, in their hands. This forced disappearance has resonated far beyond the landscapes of rural Chubut. It has become a key media story in Argentina, and the focus of a broad campaign both in the country and well beyond. Massive marches that have brought varied sectors of the Left together with indigenous and human rights organisations were held around the country on August the 11th and again on September 1st. Condemnation of the government’s actions has been widespread, and has included repeated calls for action by the United Nations Committee on Enforced Disappearances. The Macri administration’s role in the 28 year old artisan’s disappearance and its actions and statements to the media since then, have added fuel to the outpouring of anger about the case. Security Minister Patricia Bullrich, to whom the Gendarmerie responds, refuses to assume any responsibility in the matter. Instead, with commercial media, the government has deployed varied strategies that distract from its own role in the raid and disappearance, and that discredit Maldonado, his family and the Lof. In the commercial media, Maldonado has been painted as a violent, dangerous man - a terrorist, as the media paint all Mapuche who resist. Officials have also created a web of contradictory statements: Maldonado was not present during the raid, he accidently drowned during it, he has been spotted in other provinces. Providing credibility to such hypotheses, the government put up a 500,000 peso reward, which in September it quadrupled to 2 million pesos. In addition, instead of providing them with support and keeping them up to date, varied branches of the state have blamed both Maldonado’s family and the Lof Cushamen for the absence of any progress in the investigation which it claims to be carrying out. That investigation has not followed up on any of the many leads suggested by witnesses at the Lof and by the research carried out by the family and its lawyer. It is also being headed by the same judge Otranto who has ordered the previous raids against the Lof. Moreover, some of the evidence that has been released – over a month after the fact, has obviously been adulterated, with no apparent effort made to hide the fact. The Maldonado family are in torment. In interviews, Sergio Maldonado sometimes refers to his younger brother in the present tense, sometimes in the past tense. He has said he still has ‘minimal hope’ that Santiago is alive. However, after the latest ‘search’ of the Lof Cushamen’s territory on September 18th, carried out under total secrecy, he stated that his ‘fear is that they go and throw my brother in there and invent more stories about what happened’. Sergio, like many others following the case, argues that the government is looking in the wrong place, and ‘doing everything not to find him’. The government’s action since August 1st show that one cannot consider either the disappearance or officials’ reactions as mistakes, misjudgements or aberrations, as some reports insist. Too much evidence points to the case as one more terrible demonstration of Argentina’s repressive state apparatus. Chief amongst these is the fact that the August 1st raid was not the first in which live ammunition was fired at members of the Lof Cushamen. Resonances with the military junta of 1976-1983, which disappeared 30,000 people, have been foregrounded in the campaign for Santiago’s reappearance. Indeed, since taking power at the end of 2015, the Macri government has attempted to roll back the trials of military repressors that were initiated during Nestor Kirchner’s administration. It has also intensified the use of violence – which is a persistent feature of Argentine democracy – against social mobilisation in general. In addition, the person who appears to have planned the August 1st assault and who was present at the time of Maldonado’s abduction, Bullrich’s cabinet secretary Pablo Noceti, is a lawyer who has defended members of the junta. 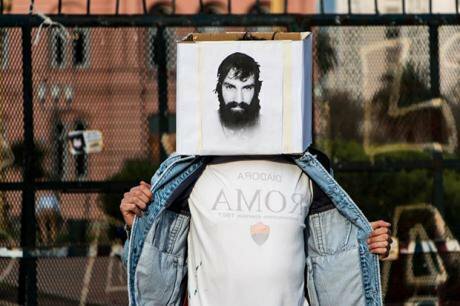 The disappearance of Santiago Maldonado has been caught in the political tide of Argentina’s mid-term elections that are scheduled for October 2017. Media sympathetic to the Kirchnerist opposition has devoted resources to covering the case and to denouncing the Macri administration’s actions. Yet forced disappearances are not a speciality of the political right, and Maldonado is far from being the only person to disappear in times of democracy. It is estimated that at least 200 people have been forcibly disappeared in Argentina since 1983, and at least 5000 tortured and killed while in police custody. A majority of these cases occurred during the ‘progressive’ Kirchner governments. Further, in conflicts involving indigenous peoples, the practice of disappearance, together with other forms of state terror, has long roots that stretch back far beyond the last military junta. In the ongoing conquest of indigenous lands in this part of the country, many Mapuche have disappeared. Amongst them are father and son Genaro and Cristian Calfullanca, rural workers who vanished in April 2013, just before they were due to give evidence in case on illegal land sales. Given Argentina’s intense racism, their names have not become widely known. 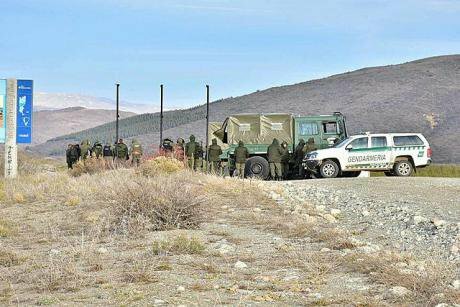 National Gendarmerie troops and vehicles in Pu Lof Mapuche in Resistencia de Cushamen (Chubut, Argentina), after the repressive operation during which Santiago Maldonado disappeared on August 1, 2017. Image: Free movement of the South, CC BY 4.0. Members of the Lof Cushamen are living in a state of siege. Not only their territory, but the whole region has been subject to intense militarisation. The three ‘searches’ of their land, carried out by hundreds of heavily armed special forces, have not brought Maldonado back. During these raids, police have destroyed houses, stolen food and other basic goods, and identified, harassed and detained residents. Special forces are targeting not only the Lof Cushamen but also the neighbouring Lof of Vuelta del Río, whom they have subjected to increased harassment and surveillance since Maldonado’s disappearance. On September 18th, the police attacked them, and members reported being beaten, tortured and detained. In order to try and get assurances that the state cease persecuting them, they peacefully occupied judge Otranto’s offices in Esquel on the 20th, demanding, like the Maldonado family, the judge’s replacement. In retaliation, that night armed paramilitaries invaded their territory and burned two houses to the ground, those of Marcelo Calfupan and of Rogelio Fermin, the latter for the second time. Silvio Huilinao, who is also from Vuelta del Río, says that a principal line of defence for them is to make their voices heard, and for their struggle to be known. He also stresses that the violence persecution they are suffering now is nothing new, and that indigenous peoples have long been subjected to them. Today, he adds, ‘most of the Mapuche people are living through very difficult times’. "For a handful of humans to live well requires the disappearance of many others, and not only of human beings, but also of life itself, of nature". Millan is longko (leader) of the Lof Pillan Mahuiza in western Chubut province, which is resisting plans to build a mega-dam in the Andes that would flood a vast region in order to supply energy to mining projects. As he and many others in Latin America describe it, capitalism is a ‘death project’ that disappears not only people but also nature and forms of life. In the current moment, in Argentina as indeed in other countries in the region, that death project is taking a sharp turn towards the deployment of greater violence. Through its brutal actions, the Macri government is sending a clear message not only to the Mapuche members of the Lof Cushamen, but also to the hundred or so Lof in the province, as well as to Mapuche - and others - in other provinces. This is that it will ruthlessly pursue those who resist the expropriation and devastation of land, which are central pillars of the country’s post-2001 model of growth. Santiago Maldonado’s forced disappearance in the conflict of the Lof Cushamen is as a marker and a warning about the resurgence of the repressive state in Argentina. As Sergio Maldonado has said, the case is a complex one that isn’t only about his brother, but is also about deterring others from getting involved in social mobilisation.